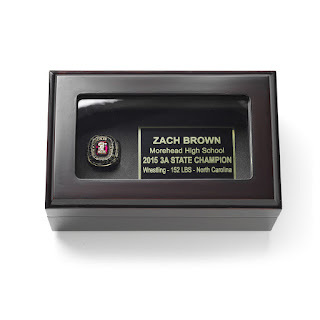 A championship ring is more than just a piece of jewelry, but the perfect way to symbolize victory and crown a high achievement. You will surely want to wear your ring when you first get it, but how do you make sure that it stays damage free and protected? 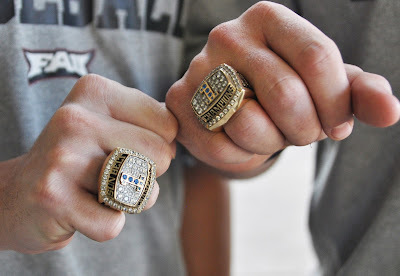 These simple tips will help you preserve your championship ring for years to come! During the honeymoon time with your new ring, you are likely to want to wear it everywhere. While you may just be going to class, work, or out eat, your hands encounter a lot of activities that can cause signs of wear. Using lotions, oils, gels, and soaps while wearing your ring can also tarnish it. These pollutants can dull your rings shine and leave dirt and grime attached to the stones and ring itself. The best way to prevent your ring from collecting unnecessary scratches and getting covered with filth is to remove it from your hand whenever you may encounter physical activities or applying any oily liquids to your hands. Simply by letting your ring soak in warm soapy water for 20 minutes and scrubbing it with a toothbrush is an excellent way to keep you ring looking good as new. When you're not wearing your ring, where does it go? In a jewelry box, in a drawer, on your dresser? 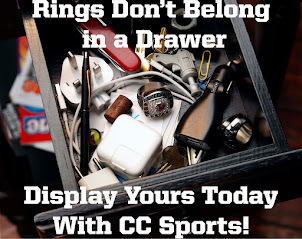 Putting your ring in a championship ring display case is a great way to keep it clean and protected. It prevents your ring from obtaining scratches from other items found in a jewelry box or drawer and keeps your ring dust free. Keeping your jewelry clean and maintained would prolong its life. Having this type of jewelry shows your hard work and passion for the game. But not all of us can have that I guess looking into wholesale jewels in China is an option.